Mounting to wall: Shaft sawn off and rests on a stone ledge. No other obvious fixing. Condition (cracked, paint peeling, woodwork, damage etc): Good. 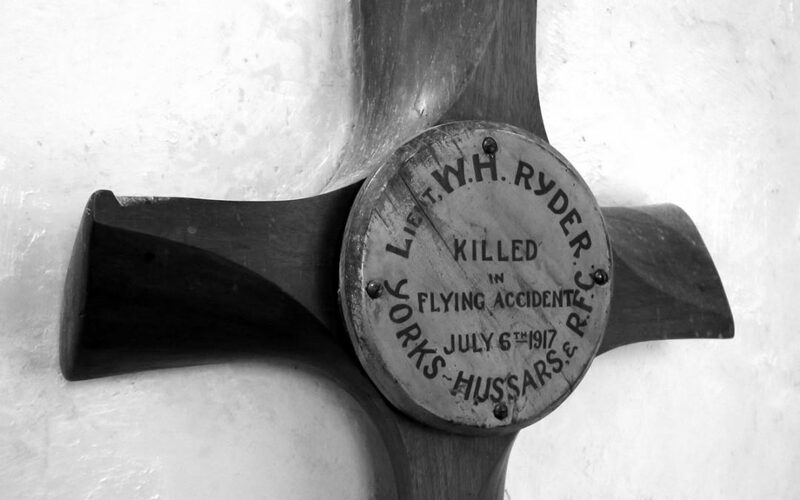 At the time of the accident in which he and his observer were killed Ryder was flying a DH4 light bomber which had a four bladed propeller, so it is possible that the cross in the church was made from his propeller. He was 20 at the time of his death. He is buried in Warloy-Baillon Communal Cemetery Extension between Amiens and Arras. His father’s family came from Yorkshire and he was born there. His father, Charles Foster Ryder, bought the manor of Little Thurlow and the Great Thurlow estate in 1898. His mother died in 1907 and his father married Mabel Sims in 1911. One of the children of this marriage, and William’s half-sister, was Sue Ryder, founder of the Sue Ryder Foundation and later Baroness Ryder of Warsaw. She married Group Captain Leonard Cheshire VC, founder of the Leonard Cheshire charity. They are commemorated in nearby Cavendish church. 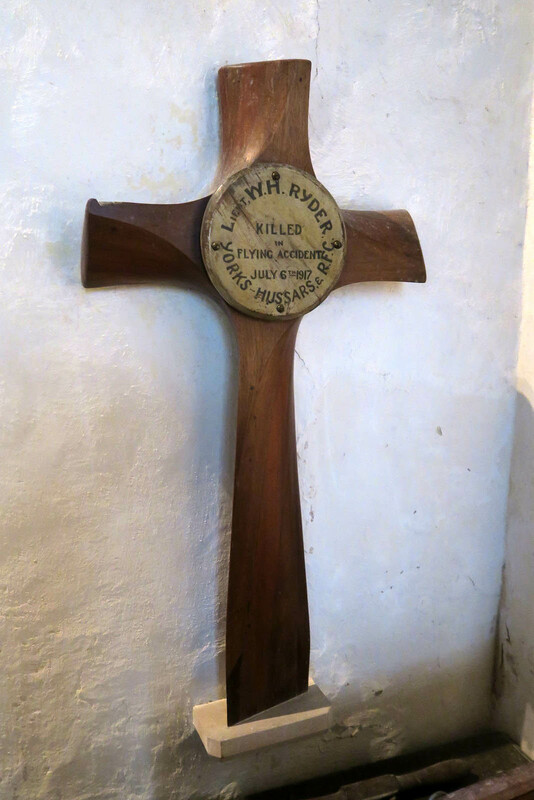 Ryder’s cross stands at the west end of the Soame chapel in St Peter’s church close to memorial tablets to his father and his father’s second wife Mabel. The Soame family were lords of the manor from the late sixtennthe century until the nineteenth century. The monument to Sir Stephen Soame is almost outrageously elaborate. There is a detailed page on Ryder on the Great Thurlow website and a piece by Rod Gibson on page 19 of the Thurlow Village Link magazine of October 2014. St Peter’s also has a maquette of St Edmund by Elizabeth Frink in memory of her father.